Speciation is a process within evolution that leads to the formation of new, distinct species that are reproductively isolated from one another. Anagenesis, or ‘phyletic evolution’, occurs when evolution acts to create new species, which are distinct from their ancestors, along a single lineage, through gradual changes in physical or genetic traits. In this instance, there is no split in the phylogenetic tree. Conversely, ‘speciation’ or cladogenesis arises from a splitting event, where a parent species is split into two distinct species, often as the result of geographic isolation or another driving force involving the separation of populations. 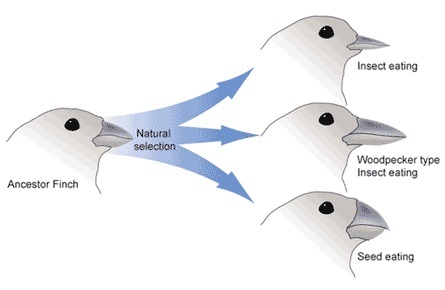 The reproductive isolation that is integral to the process of speciation occurs due to reproductive barriers, which are formed as a consequence of genetic, behavioral or physical differences arising between the new species. These are either pre-zygotic (pre-mating) mechanisms, for example, differences in courtship rituals, non-compatible genitalia, or gametes, which are unable to fertilize between species. Alternatively, they are post-zygotic (post-mating), for example zygote mortality or the production of sterile offspring. Reproductive isolation leads to reinforcement of the distinction between species through natural selection and sexual selection. Allopatric speciation occurs when members of a population become geographically isolated from one another, to the extent that genetic exchange, through mating, is prevented or interfered with. This may be a result of geographical changes, such as the formation of a mountain by a volcano, island formation, habitat separation by glaciers and rivers, or habitat fragmentation caused by human activity. Alternatively, species members may emigrate, resulting in population separation by dispersal; this is commonly known as vicariance. The separated populations then undergo divergence in genotypic or phenotypic traits as a result of different selective pressures acting upon populations. This leads natural selection to cause genetic drift as mutations arise within populations. Over time, the separate populations may develop morphologically distinct features due to adaption to their new environment. The features may become so distinctively different that reproductive isolation occurs, preventing the inbreeding of populations and thus forming new species. If the populations become sufficiently different that they are classified as new species, but not distinct enough for reproductive isolation to occur, the species may come back into contact and mate, producing hybrids. The extent of the effect that geographic barriers may have on a population often depends on the dispersal ability of the organism; for example, the new formation of a river in a landscape would create an impassable barrier for small terrestrial mammals, insects and reptiles. However, birds and larger mammals would likely disperse across the river with ease. An elegant example of allopatric speciation, which first inspired Charles Darwin to develop the theory of evolution and natural selection, is the divergent populations of finches inhabiting the Galapagos Islands, and known as ‘Darwin’s finches’. Darwin noticed that each of the Galapagos Islands hosted a population of finches, which although relatively similar in morphology (compared with other bird species), exhibited slight differences in features such as body size, color and beak length or shape. He noted that there were different food sources available for the birds on each of the different islands, and came to the conclusion that the differences in beak shape were an adaption toward acquiring the particular food source. Sympatric speciation is the evolutionary process whereby species are formed from a single ancestral species while inhabiting the same geographic area. In contrast to allopatric speciation, the distribution ranges of species which evolve through sympatry may be identical or they may only overlap. Rather than geographic distance prompting a reduction of gene flow between populations, sympatry occurs when members of one population make use of a new niche. This could occur, for example, if a herbivorous insect begins to feed on a new or novel plant source with which it was not ancestrally associated, or if a new species of plant is introduced to the species’ geographic range. As insects generally reproduce or lay eggs within the type of fruit that they were born in, over time, the individuals would specialize in feeding and mating on particular fruits. Consequently, gene flow between populations that specialize in different fruits will be reduced, leading to reproductive isolation of the populations. It is possible that the populations will also develop morphological differences as they adapt to most effectively exploit the new niche. Although sympatric speciation does sometimes occur, it is uncommon, especially within large, multicellular organisms. Parapatric speciation is an extremely rare case of speciation that occurs when a population is continuously distributed within a geographic area without any specific barriers to gene flow. Nonetheless, the population does not mate randomly within the population, but rather individuals mate more commonly with their closest geographic neighbors, resulting in uneven gene flow. Non-random mating may increase the rate of dimorphism within populations, in which varied morphological forms of the same species are displayed. The result of parapatric speciation is one or more distinct sub-populations (known as ‘sister species’), which have small, continuous overlaps in their biogeographic range and are genotypically dimorphic. 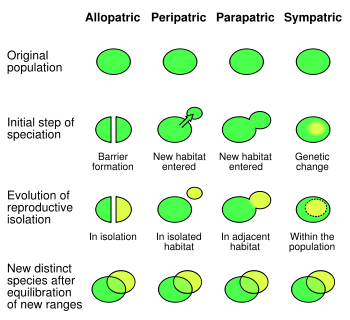 Peripatric speciation is a form of allopatric speciation that occurs when populations that have become isolated have very few individuals. Through this process, the population goes through a genetic bottleneck. Within the small sub-population, organisms which are able to survive within the new environment may carry genes that were rare within the main population but that cause a slight variation to behavior or morphology. Through repeated matings, the frequency of these, once rare, genes increases within the small population. This is known as the ‘founder effect’. Over time, the characteristic that was determined by the gene becomes fixed within the population, leading to an isolated species that is evolutionarily distinct from the main population. Artificial speciation is the form of speciation that can be achieved by the input of human influence. By separating populations, and thereby preventing breeding, or by intentionally breeding individuals with desired morphological or genotypic traits, humans can create new, distinct species. This is also known as ‘artificial selection’; most modern domesticated animals and plants have undergone artificial selection. Although evolution of our modern crops and livestock has taken thousands of years, it is possible to visualize the process of artificial selection in species that have short life cycles. Artificial selection has been demonstrated most effectively in species of Fruit Fly (Drosophila melanogaster). Experiments in which flies are placed into environments which contain different resources or habitats show the changes that occur when the flies adapt to each environment. After several generations, the flies are removed from the experimental zone and are allowed to cohabitate, although the populations are unable to mate due to the reproductive isolation process that occurred while in isolation. Morphology – A branch of biology that relates to the structure, form and physical characteristics of an organism. Genotype – The set of genes within DNA that is responsible for particular traits. Population – The community of animals or plants in which interbreeding occurs. Species – The largest group of organisms in which individuals can breed and produce fertile offspring. C is correct. Allopatric speciation occurs when populations are separated by a geographical barrier and cannot easily disperse across the barrier. A is correct. Parapatric speciation is rare, and requires extreme gene flow disruption to take place. Large mammals are likely not to specialize in one particular niche; therefore, the novel niche would rarely be adopted as a sole resource, and genetic or morphological adaptions to exploit the niche would be unnecessary. 3. Which of the following is not a product of reproductive isolation? B is correct. Reproductive isolation prevents newly formed species from mating or reproducing successfully. If fertile offspring are produced, then reproductive isolation has not occurred. D is correct. Speciation can lead to any difference in a species’ morphology or genotype. It is partly responsible for the vast diversity of species we have today.